This is my little happy silly faced guy that my kids were not feeling. 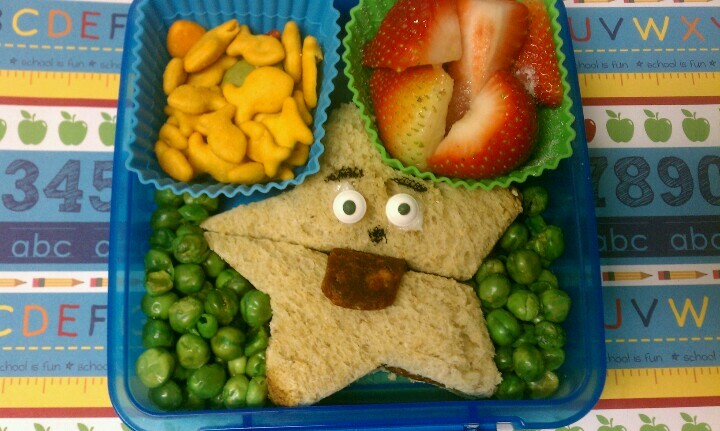 Anywho…from the top: gold fish, strawberries, dried peas. The sandwich is whole wheat bread with nutella. The candy eyes are held in place with icing and the tongue is raspberry Fruit Flats. Attempt #2 at “cut out” sandwiches. Its the exactly the same as the first sandwich: Whole Wheat bread and Nutella. I use the medium circle cutter and was able to get four circles per sandwich. My kids thought they looked like Krabby Patties. They stood there by the cutting board with open mouths like little birds waiting to eat the scraps (which were delic…) so I added them to a little plate from IKEA to accompany their bowl of cereal! Win-Win. 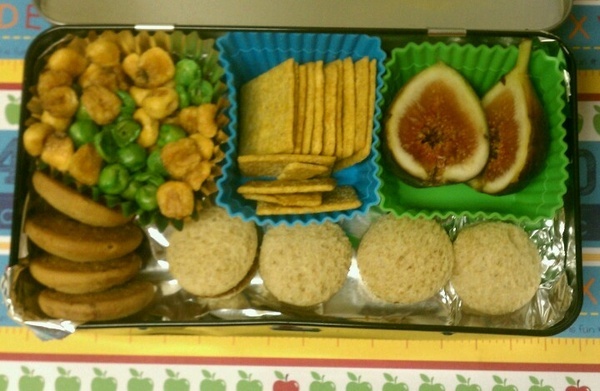 On to the rest of the box: Dried peas and corn, a fig, sugar free cookie (the kids have no clue). the cutest little apple I’ve ever seen! It’s a little bigger than a ping pong and some Wheat Thins. Basically the same box minus the apple. 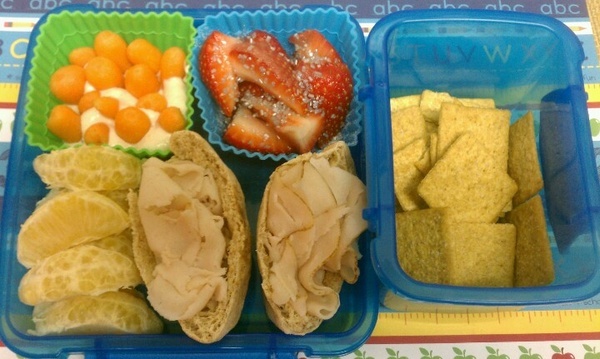 This is cut carrots in Baba Ghabouj, strawberries with silver sprinkles, clementines, mini whole wheat pitas with turkey and Wheat Thins for gymnastics snack. I have a kid who loves apples and hates brown spots on his apples. I don’t always have time to let them soak in pineapple or lemon juice. 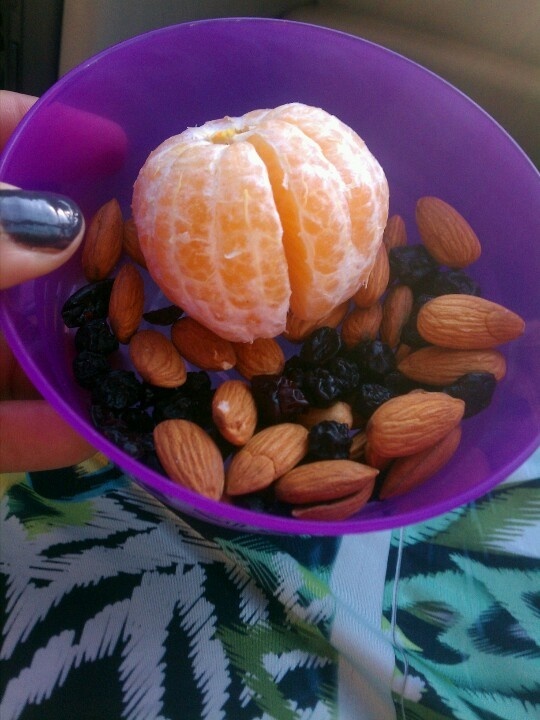 I learned a new trick over at Another Lunch blog that works wonderfully plus my kids think its cool. 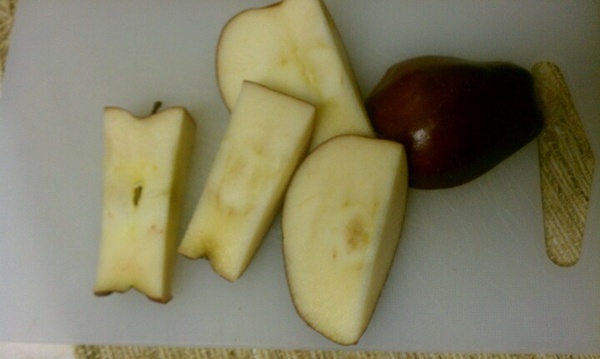 Cut the sides off of the apple leaving a square core. 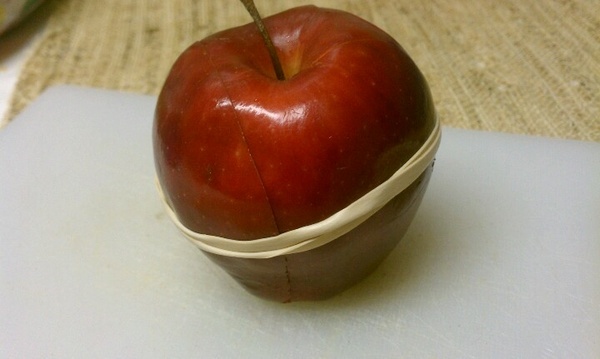 Put it back together and secure with a clean rubber band! Mess free, brown free and no extra dishes! Thanks for hanging out with us! 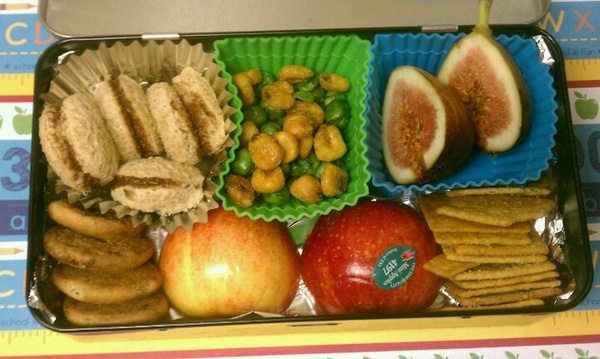 Have a great Bento week! Next Post “Currently” Challenge-This just happened.